With renewed focus, under CEO Satya Nadella’s leadership, Microsoft is patiently focusing on longer-term objectives. Case in point is the recent announcement, per Bloomberg, that Microsoft won a $480 million contract from the U.S. Army to supply augmented reality headsets based on its HoloLens technology. The deal may lead to deployment of up to 100,000 HoloLens devices. Microsoft announced HoloLens in January 2015 during the Windows 10 launch event in Redmond, Wash. Over a year later, in March 2016, a pre-production version of the HoloLens development kit shipped in the U.S. and Canada. In October of that year, Microsoft expanded availability to include Australia, Ireland, France, Germany, New Zealand, and the U.K. Throughout 2017 and 2018, Microsoft continued to showcase enterprise-focused HoloLens scenarios and engage developers in larger organizations who were interested in developing business-specific applications. Halfway through 2018, during its Build conference, Microsoft announced two general-purpose mixed-reality applications supported by HoloLens: Remote Assist and Layout. 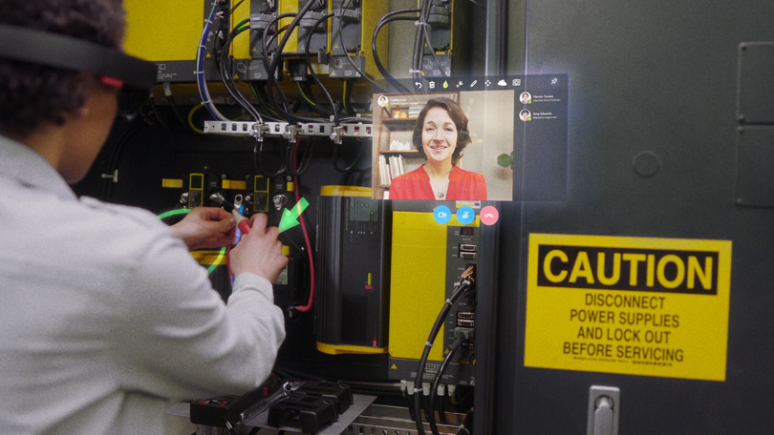 If collaboration is defined as two or more people working together to achieve a common goal, then augmented reality via HoloLens represents an example of an ultimate collaboration device. 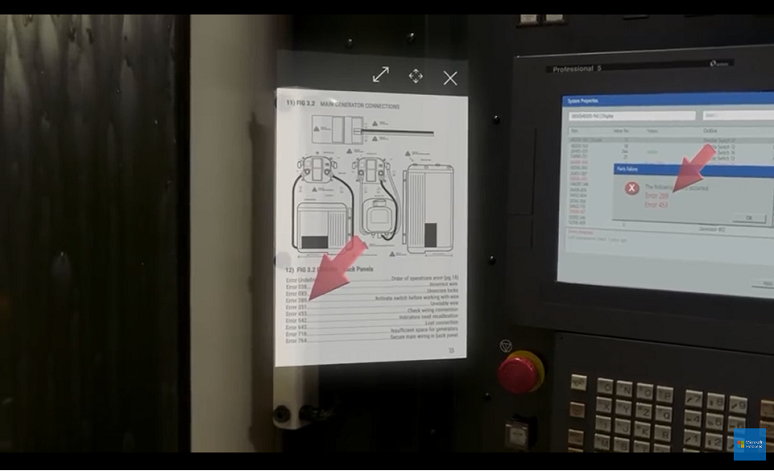 Earlier this year, I was able to repair a malfunctioning piece of machinery I had never seen before using the Remote Assist application, in a simulated environment (see my earlier coverage, here). Because the HoloLens-powered version of mixed reality supports collaboration with a shared perspective, a remote expert using Teams could talk me through a repair procedure while seeing what I was seeing. She could annotate on my field of view, highlighting a specific wire that required replacing, for example. Further, the remote expert could confirm that I had selected the proper replacement part and give me tips during the installation process, even sharing specific technical diagrams, which appear to float just beside the broken machine, as required. Since its introduction, there has been a steady clamor for a consumer-based, inexpensive version of HoloLens that also possesses a wider field of view. However, over the past four years, Microsoft has resolutely focused on targeted, industry-based applications of HoloLens and the internal and external developers who support these industries. These applications include remote repair, pre-implementation design preview, and refinement, and complex training related to topics such as jet engines or anatomy. The ability to focus rather than chase the market, apparently enabled by Nadella’s leadership, provides the opportunity to develop a virtuous cycle: Industry focus yields large U.S. Army deal that in turn accelerates development of hardware enhancements, which eventually may accelerate a consumer-based, lower-cost version of HoloLens that then greatly expands market, opening other targeted opportunities. Playing the long game with HoloLens is not an isolated example. Microsoft demonstrated its willingness to disrupt its own market-leading Skype for Business unified communications product to capture the broader collaboration and communications market with Teams. Microsoft has steadily improved and expanded its first-party Surface hardware lineup since 2012, lifting the brand to top five in U.S. hardware sales as of October 2018, according to Gartner. Similarly, with both artificial intelligence and quantum computing, Microsoft is steadily developing the tools and engineering necessary to enable fundamental advancements, while mostly avoiding the immoderate headlines favored by its many competitors. Of course, only time will tell if patience truly is a virtue. I spend my time helping organizations and IT Teams plan and implement successful technology solutions, most often related to communications and collaboration and most often based on Microsoft technologies. The increasing number of choices provide fantastic opportunities but also new pitfalls and plenty of confusion. If you have specific questions please comment below, send me a tweet @kkieller, or message me on LinkedIn.